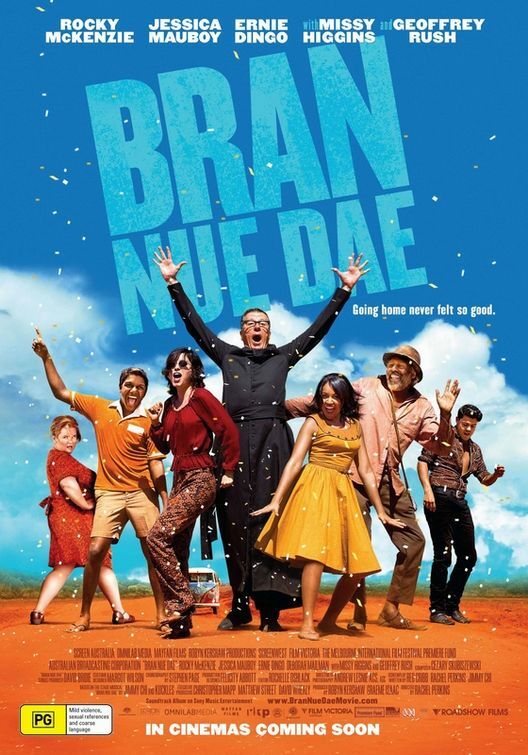 Bran Nue Dae is a bit of a romp, but I’m not entirely convinced this film has survived some of its more irksome quirks. By and large the story sings, the direction is clear, and the cinematography is inspired, but a few lines of uninspired dialogue, a few missed beats, and the occasional diversion from the film’s primary mode of storytelling let down what is otherwise a light, unassuming comedy that would do the Australian film industry proud. Ernie Dingo and Geoffrey Rush could be said to have saved this film. In the lead role is Rocky McKenzie, who can sing, but comes across rather wooden, even in singing mode. If it were a stage play, I would say it was over-rehearsed, but I’m not sure that’s possible with film. I would assume Jessica Mauboy was cast for much the same reason: her voice is spectacular, and this is one of the film’s redeeming features, but the moment she must speak it’s like she seizes up and loses all sense of her character. Missy Higgins is another actor who was surely cast for her musical talent, but whose performances as a character were charming, mesmerising and hilarious. I don’t want to be too critical, because I actually really liked the film. It has a great story, some hilarious characters and scenarios, and some really great music. I just couldn’t quite relax into it.